Libor Novacek was born in Prague, Czech Republic, and his early studies were at Teplice Conservatoire. In 1998 he was awarded a full scholarship to the Guildhall School of Music & Drama in London, graduating with an MMus and a Fellowship. He studied with Professor Joan Havill and participated in masterclasses with Lazar Berman, Murray Perahia, John Perry, Jean Efflam Bavouzet, Dmitri Bashkirov, Dominique Merlet and others. During his studies in London he won numerous national and international awards and was recipient of several major scholarships. 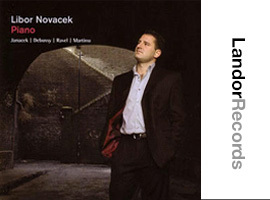 Internationally recognised for his interpretations of Liszt, Brahms and Janacek, Libor Novacek’s playing is said to possess ‘exceptional poetic verve and inwardness’ and his recordings (Landor Records, UK) are said to have ‘set new benchmarks’ and offer ‘compellingly beautiful and narrative performances’. Four CDs to date have received outstanding reviews in the classical music press: Liszt’s Années de Pèlerinage–Italie and Mephisto Waltz, was Editor’s Choice in Gramophone Magazine and awarded the 'Diplôme d’Honneur' by Liszt Society in Budapest. His recording of music by Brahms marked him as an ‘artist of vision and phenomenal sound control, offering readings of radiant sensitivity’. It was highly praised in the Guardian, Gramophone and International Record Review and was selected as the BBC Magazine’s ‘Instrumental Choice’ in August 2008. Libor’s latest CD featuring works by Liszt (Années de Pèlerinage- Suisse and Consolations), received the greatest critical acclaim, including 5 stars in the Guardian, International Record Review, Gramophone and Pianonews. Libor is sought after as a recitalist and chamber musician and the founding member of the Prague Piano Trio. He also gives masterclasses and lecture recitals. His performances have taken him on major international concert stages (Barbican Centre, Royal Festival Hall, Wigmore Hall, Cadogan Hall in London, Rudolfinum in Prague, Hamburger Musikhalle, Teatro Colón in Buenos Aires, Kennedy Centre in Washington DC) and he has performed on tours and festivals throughout the USA, Argentina, Brazil, South Africa, India, Spain, Germany, Italy, France, Czech Republic and others. 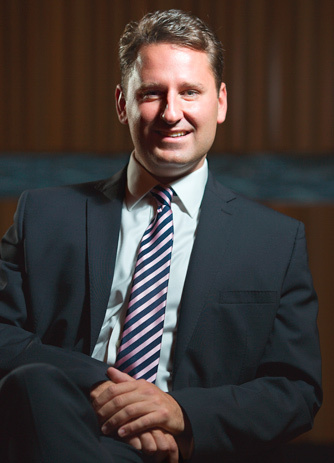 Currently Libor is Gastprofessor of piano at the Universität für Musik und darstellende Kunst Graz in Austria and holds a full time teaching position at Prague Conservatoire. My musical background and training is wide and varied and informs both my teaching and my own performing. I began studying the piano in Prague with my uncle, Prof. Miloslav Mikula, a disciple of the renowned Professor Erna Grünfeld of The Prague Conservatoire who created a unique teaching method for young pianists. The method is based on the Russian piano school of Heinrich Neuhaus and incorporates central European teaching traditions. At eighteen years I entered the Guildhall School of Music & Drama in London under a full scholarship. In London I studied with Professor Joan Havill, whose main training was in the Hungarian school that is based on teaching of Franz Liszt, Jozsef Gát and Béla Bartok. I studied Alexander Technique with the famous Polish/British teacher Nelly Ben-Or and trained in Meditation and Hypnotherapy with Josephine Teague. Masterclasses with international artists including Lazar Berman, Murray Perahia, Dmitri Bashkirov, Alexander Lonquich, and John Perry widened my understanding of interpretation and style. Over the last fifteen years I have worked with piano students from young beginners to professional pianists with international careers. I advise students preparing for auditions, concerts, and competitions and have given masterclasses in several European countries. I am currently Gastprofessor of Piano at the Universität für Musik und darstellende Kunst Graz in Austria and Professor at the Prague Conservatoire in the Czech Republic and teach privately. I enjoy a wide piano repertoire ranging from early Baroque to the late 20th Century, and in the last decade I have specialised in music from the Classical period (Haydn, Mozart, Beethoven), Romantic and Post-Romantic period (especially Liszt and Brahms), Impressionism and the music of Czech composers such as Janacek, Martinu, Dvorak and Smetana. I particularly enjoy working with advanced musicians on musicianship, technique, interpretation, and pedagogical skills. An understanding of the psychological and physiological side of piano playing and performing is an important side to my work too. I use various forms of meditation and mental preparation and the basic principles of Alexander Technique. In order for students to develop and maximise their musical skills, it is essential to adopt and maintain the correct natural posture in front of the instrument, developing the necessary muscles for a solid piano technique. Muscle tension must be minimised to play with an absolute body freedom, both in daily practice and on the concert platform. I search for a round, solid and colourful sound, a wide dynamic range, and variety of articulation to aid the tonal shading and development of a legato touch through the transfer of weight from finger to finger, allowing the flow of a continuous ‘cantabile/legato’ melodic line. And an informed use of the pedals adds to clarity of sound and the expressiveness of the music. A complete musical education requires extensive memorising skills. I employ and teach what I call a “four-layer” memory, which involves several different levels of understanding of the score and the approach to the keyboard: aural memory; finger/muscular memory involving feel/touch and distances (the so-called map of the keyboard), analytical memory (score analysis using harmony and musical form structure) and lastly the visual memory of the score. My quest as a teacher is to develop the artistry and musicianship of each student, and not only instil in them a deep understanding of the technical side of playing - correct practising habits, healthy use of the body (muscles, arms and fingers) and pedalling - but also of the artistic side - stylistic awareness, compositional styles, emotions, colours and atmosphere. I encourage students to recreate the authentic version of each composition, carefully observing all markings of the score (often researching the composers' autograph manuscripts), understanding the historical background, and searching for the meaning of the piece through careful analysis and adequate sound spectrum. My approach is personalised to the needs of each student, guiding them to find their own artistic voice and unique musical personality. "Beautifully phrased, subtly coloured and acutely characterised, Novacek's playing is outstanding." "Novacek is deeply sensitive to high-octane drama, playing with an enviable fluency and conviction. He is highly rewarding artist that shows clear textures, warm tonal colours and insightful musicality. His playing captures a reflection and nostalgia at the heart of music...a master of inwardness." "Libor Novacek gave a spine-tingling and in my experience unsurpassed performance of Mussorgsky’s Pictures at an Exhibition." 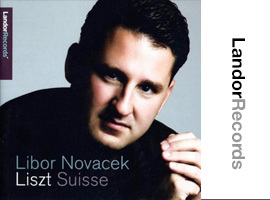 "The Czech pianist Libor Novacek’s considerable reputation rests primarily on his Liszt performances, though he is also a superb Brahmsian... This is big-boned playing, very Romantic and covering a huge dynamic and emotional range. The high point comes, however, with Novacek’s performance of the Op 117 Intermezzos, which are heartbreaking in their quiet intensity. Novacek reveals himself a master of high poetry, lyrical beauty, dark and sinister moods and refined shadings." 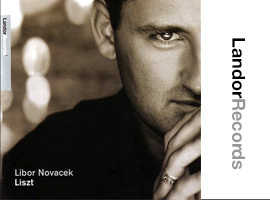 "Libor Novacek demonstrated his ability to produce a wide spectrum of rich, broad, colourful and resounding sound. Novacek enraptured himself in the music of Brahms’s 3 Intermezzi, thus making time stand still… he showed fearless and flawless touch, phenomenal inspiration and imagination, well-pondered architecture of the large passages and musical form, and often displayed his mastery over extreme technical difficulties." 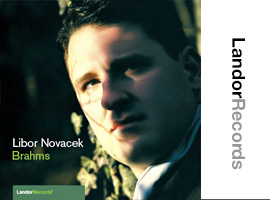 "The new Liszt CD by Libor Novacek is exceptional...he shows a rare combination of virtuosity and musical intelligence. Novacek emerges as a master of multi-linear articulation, giving independent strands of simultaneous musical material their own identity. He proves himself an artist of distinction, with readings of radiant sensitivity and tantalising understatement." 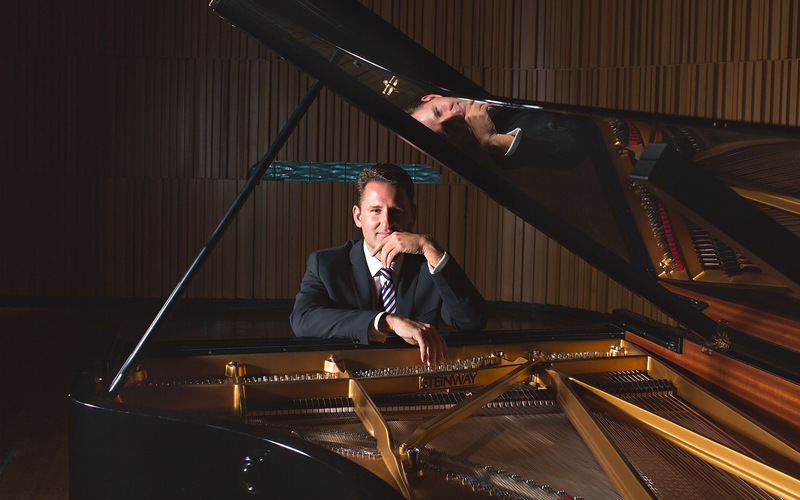 "Novacek performs Liszt with an exceptional verve and inwardness...he re-creates a rare sense of wonder and interior magic." "Highly spirited and fresh playing with great stylistic details, precision and spontaneity – such attributes define Novacek´s playing." "Libor Novacek invokes the spirits of such keyboard giants as Julius Katchen, Sviatoslav Richter and Claudio Arrau. Novacek almost suspends time, such is his concentration and his ability to maintain a steady pulse. He shows himself to be a matchless interpreter of Brahms." Listen the samples of some of my recordings which are available on iTunes and Amazon. You can download my biography and photos in print quality. © Copyright 2001–2018 Libor Novacek. All Rights Reserved.